Running a business is a lot like playing sports. Now, I’m not a big sports guy myself, but I certainly respect the passion and drive that athletes have. One of the most important things that sports does right, which a lot of businesses fall short on, is having the support from others. Entrepreneurs tend to try to do it all themselves, which in the beginning is a necessity. As your business starts to grow, though, it quickly becomes a team sport. You need to know who to have that makes up for your weakness, and who you can pass the ball to when it’s required. More importantly, at any phase of a business (just like any athlete) a business really needs a coach. In sports there are always multiple coaches for one team, and your business should run the same way. Even in solo sports, like Tennis, athletes have coaches to make sure their game is as good as it can be – and they look for problems that the athlete may not see. You should be doing the same. A coach is a great thing to have, no matter how big your business is right now. It’s always great to have an extra set of eyes to show us what we can improve on. The last things athletes do that’s truly remarkable is seeing things through to the end. Even if they know they are going to lose a game, they finish it. They do it, not because they have to, but because they can always continue to learn – even if there’s no hope. In business this is a little trickier. We don’t have a clear ending, but we need to know when is the right time to move one. When we’re done learning and the game is over for us. On this episode of Creative Warriors, I brought in someone who really knows what it means to see things through to the end: Christopher Wirth. No Quit Living works with individuals, families, teams and corporations to help improve accountability, effectiveness and efficiency. 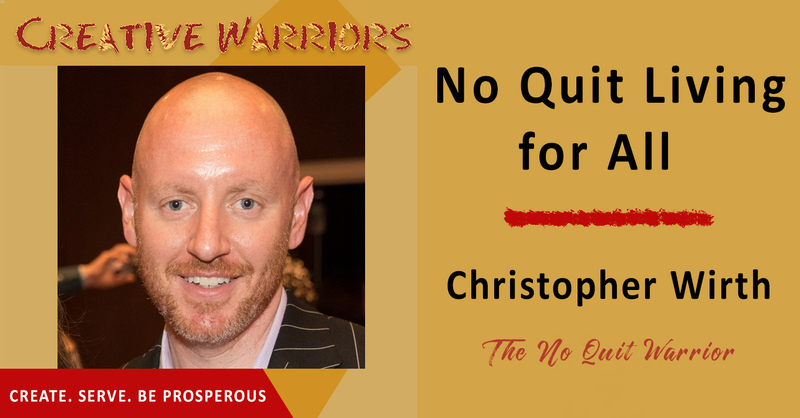 Christopher aims to motivate and inspire his clients to never give up on themselves, their dreams or their goals. After playing both Basketball and Tennis in College, Christopher began his coaching career as an AAU Basketball Coach (Amateur Athletic Union), Collegiate Basketball Coach, as well as High School Basketball Coach. Download this episode today and learn how you can live a life filled with accomplishments. You always have the choice to stay positive, even if bad situations. Always reverse engineer wherever you are looking to go. Just like in sports, businesses need a good coach to be successful. There’s no need to have only one coach. Starting your day by looking at your phone puts you in a reactive mindset, instead of a proactive one. In some ways you’re alone, but you always have the ability to reach out to a mentor. Be in a place that helps motivate and inspires. You always have the ability to learn. It’s not quitting if you give it your full effort, and everything you have. Always be open to listening to other people. Use the “waffle method” of goal setting. My greatest source of inspiration is other people. You can always find positive information, if you look for it.